This Sour Cream Banana Bread beat out the competitors and won the hearts of a room full of women. It really is the best! I’m not sure why exactly I agreed to do another wedding cake. I got swept up in the moment, I suppose. 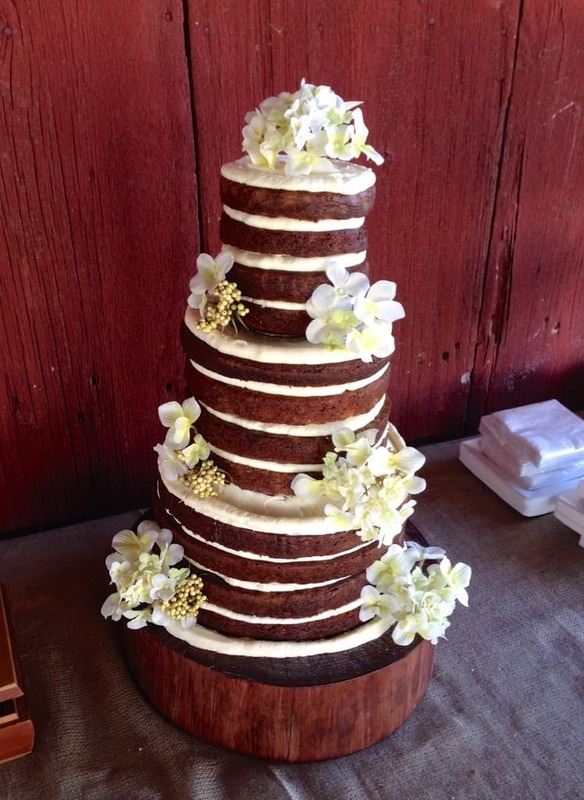 My mind started buzzing as soon as I heard the words, “banana bread cake.” What a stupendous choice for a wedding cake. I didn’t think about logistics at that point. I just said yes. It wasn’t until I was on batch 10 of 14 that the full realization of what I had committed to finally hit me. This was an undertaking. But unlike my last wedding cake, I somehow didn’t find myself feeling stressed at this point. Instead, I was almost…enjoying myself. By batch 8, I had fallen into a rhythm. The ingredients were committed to memory. I knew exactly which bowls I would use and the precise order of every step. I could whip out four batches of banana bread in under an hour, and it felt oddly exhilarating. I used to think I would get bored in a bakery, forced to make the same thing over and over. But after this experience, I have a new appreciation for repetitive baking. There’s something incredibly satisfying about making the same recipe so often it becomes engrained in your person. Somewhere along the way, concentration becomes unnecessary as muscle memory kicks in. Your hands move without your bidding, cracking eggs, scooping and leveling flour, sprinkling cinnamon. There’s space to breathe in those moments, time to think without searching the scribbled recipe card for the next step. It’s actually quite relaxing. But you didn’t come here to listen to me wax poetic about the joys of making banana bread. You came here for the winning recipe–the one that won the hearts of a room full of women, including the most important one–the bride-to-be. 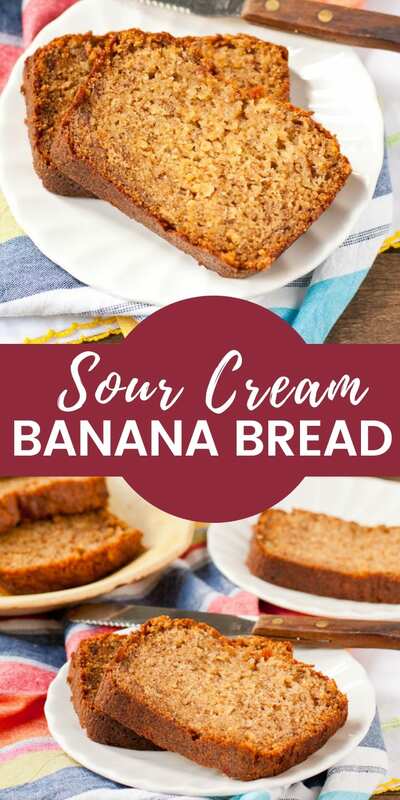 What Makes this Sour Cream Banana Bread the best? There are a few reasons why this recipe became my new go-t0, and why I think it won the most votes out of three other recipes. First, it tastes amazing. It’s sweet, rich, and buttery, but it still tastes like bread, not cake. (P.S. If you’d rather eat banana cake, you’re going to want to head straight for this Banana Crumb Cake recipe). It is absolute perfection served warm straight out of the oven, or microwaved for a few seconds a day later. It’s got a good banana flavor without being overwhelming, so even those who are iffy about bananas will likely enjoy this. What’s the Secret to Ultra Moist Banana Bread? First, as with any baked banana recipe, I always recommend using extra ripe bananas. This is your chance to use up all those extra spotty, kinda gross looking brown bananas. Secondly, using melted butter instead of oil and a mix of both brown and white sugar gives banana bread the best and richest flavor. Finally, the sour cream of course! 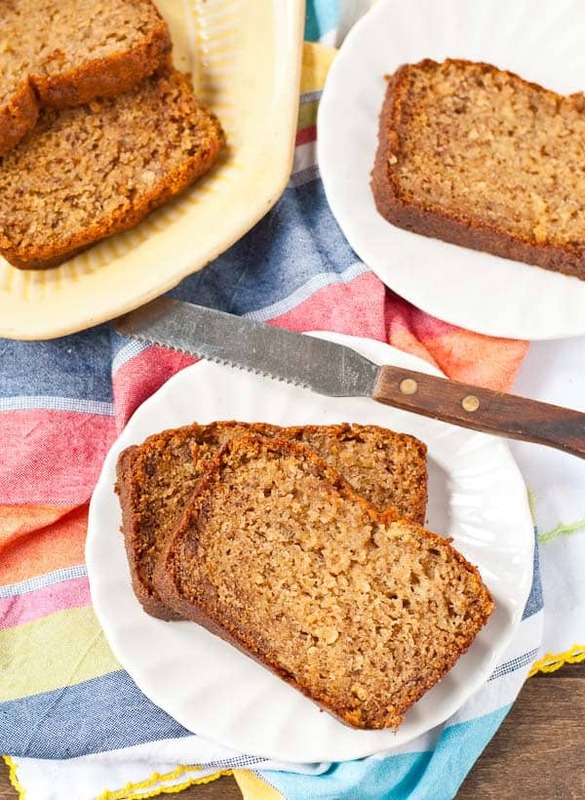 A half cup of sour cream makes this banana bread unbelievably moist and tender. One of the best things about this recipe is how easy it is to make! You don’t even need to pull out your mixer for this one. 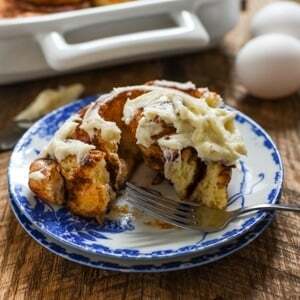 Everything is whisked together in a single bowl, beginning with your melted butter, sugars, eggs, and vanilla, followed by a swirl of sour cream and mashed bananas. All the dry ingredients–flour, baking soda, powder, salt, and a touch of cinnamon–are sprinkled directly on top then mixed together and poured into a loaf pan to bake. So easy! There are so many different ways to customize this recipe to make it your own. We sometimes add chocolate chips or nuts (pecans are my personal favorite). I’ve also made Double Chocolate Banana Bread, Cherry Chocolate Chip Banana Bread, and a Banana Ginger Bread Loaf all using this recipe as the base. You could even try a simple crumb topping or my favorite cream cheese frosting. But of course, this sour cream banana bread also tastes darn delicious without any extras at all. This is the kind of recipe I know I’ll return to over and over again throughout the years. Perhaps I’ll make it as a surprise after-school snack for my future kiddos. Or maybe it’ll grace the breakfast table on Thanksgiving morning. It may even find its way into a care package for a new mom. I’ve made this bread so many times now, it’s a part of me. And I hope it’ll become a part of our family throughout the years, bringing comfort, delight, and the satisfaction of a warm, buttery slice of bread for generations to come. There is absolutely nothing better than a slice of the best sour cream banana bread warm out of the oven. With a super moist and tender crumb and a hint of cinnamon this is my absolutely favorite classic banana bread. Grease a 9 inch bread pan with butter. Preheat the oven to 350 degrees. In a large mixing bowl, combine the melted butter, brown sugar, and white sugar. Whisk together until smooth, creamy, and no brown sugar lumps remain. Whisk in the sour cream, then add the eggs, one at a time, whisking well after each addition. Stir in the vanilla. In another bowl, mash the bananas then whisk them into the sour cream mixture. Sprinkle the flour, baking soda, baking powder, salt, and cinnamon on top of the wet ingredients, then stir everything together until no white remains. Pour the batter into the prepared pan and bake for 45-55 minutes or until a toothpick inserted in the center comes out with just a few moist crumbs. 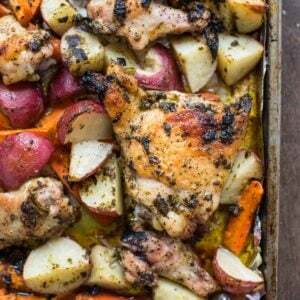 This recipe can easily be doubled and made in two loaf pans. Wrap leftover bread in saran wrap and store at room temperature for up to five days. Tightly wrapped bread can also be frozen for several months then thawed in the fridge or at room temperature. Your cake is gorgeous Courtney!!!! I’m so so impressed. Also I’m loving imagining the hundred pound of overripe bananas you must have to have kept on hand to whip this up 15 times. haha. Thanks Karen! And trust me, it was not pretty. SO MANY FRUIT FLIES. Courtney, I’ll say it again – I’m so impressed by your beautiful cake! You’re a total boss for making it. And I’m printing this recipe out and making it tonight. I’ve made dozens of banana bread recipes but if you say this is the best, I trust in your good taste and judgment. You’ve never steered me wrong! I just made these and they were fabulous! By far the best I’ve made. Thanks for the recipe! Melissa, I’m so glad you liked it! Thanks for taking time to come back and let me know. It makes my day! Hi Courtney, the cake is beautiful! Is this the same recipe used for the cake pictured? The recipe is titled “bread”, but i focused on on the wedding cake. I poured batter in TWO 9 inch cake pans! Then realized recipe called for ONE 8 inch loaf bread pan!! Wow, did I do something wrong. Baking as we speak. I am anxious how it will turn out!!! Help? HI Anita! It is the same recipe as the one pictured, but I doubled the recipe for the cakes. It should still bake up fine, but they’ll be thin so I would start checking on them after about 25 minutes. It looks like they’re probably already finished so I hope they turned out for you! Another note on the cakes: I always grease, line the bottom with parchment, then grease again so they pop right out. Hope you enjoy! Hi Courtney, thanks for responding. I baked the cakes 30 minutes, 25 would have been perfect. Next time I will use smaller pans, perhaps three 6-inch ones. Didn’t use parchment. Will next time for this recipe. Had to peel cake from pans, not a good look! Seems like a lot of batter for an 8 inch loaf. Anyway it is a very good bread/cake. I did do the frosting. Very nice! I think this is.a keeper and will make again! Thanks for sharing!! So good! Thanks for the recipe. I replaced the sugar with 1/2cup honey, used the spelt flour and added half of the banana extra. It was so delicious and still sweet more than we are use to. Next time will try less honey. Moist and perfect. Baked about 45 min. Thanks agin! I’m so glad you liked it. Thanks for coming back to let me know! So incredibly good! Absolutely the best I’ve ever made, so it’s my new go-to. I used 4 mini loaf pans and baked them for about 35 minutes, shifting positions of the pans about halfway through. Thank you so much for sharing this recipe! No white sugar Can I use 1 c of light brown? That should work fine Laura! If I wanted to make these as muffins instead of loaves, what adjustments would I need to make in baking temp and time? How many muffins do you think would result from 1 recipe? You know, I’ve actually made these into cupcakes before but I forgot to write down the details, of course. I would guess about 18 cupcakes and I would start checking them around 20 minutes baking time. 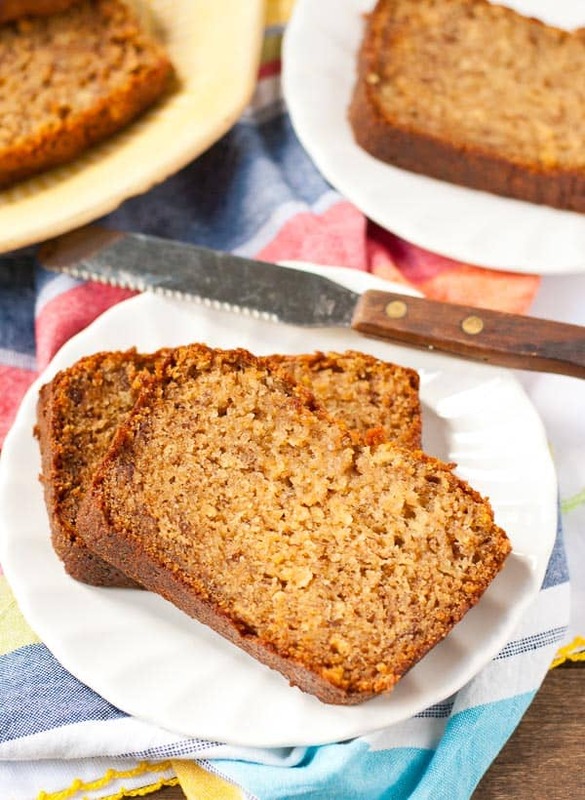 This really is a great banana bread, and I’ve made dozens of variations over time! We like dark chocolate chips in ours. Easy and delicious ? Yay! So glad you like it. I can’t wait to try it with chocolate chips! THIS is an amazing banana bread recipe. I added 1/2 cup of flour(and upped by one half all leavening ingredients;baking soda, baking powder and salt). Had an idea, moment of genius actually. Divided the batter in half. Added diced strawberries (had whole in my freezer) to one half and made muffins. Added blueberries and candied pecans to the other half, also in muffins. Both are INCREDIBLY SCRUMPTIOUS! They are a great texture, very moist, and not too sweet. Follow the procedure, adding all dry ingredients on top of wet mixture. I used a fork to “push” batter around to incorporate all “white” ingredients. Can’t wait to try these in a few days. We all know, banana bread is better after the flavors marry for a couple days-pardon the pun:the creator uses it as a wedding cake ? Oh my, the strawberries sound like a fabulous addition! And I love your pun! Thanks for coming back to let me know and for sharing your tips! I’m so glad you enjoyed the recipe. I am so glad you enjoy the bread! Thanks for coming back to let me know! 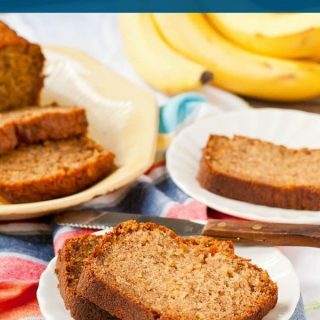 This is now my go to recipe for banana bread as I have made this 4x’s now. I also add some applesauce. I just tripled the recipe and use 2 of the 6-pak of unsweetened applesauce. This time I also added mini milk chocolate chips. I use salted butter and omit the added salt. 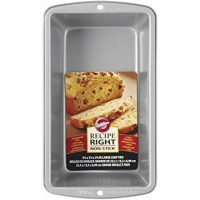 Makes 4-8″ foil pans when tripled. Love the sour cream and brown sugar in my bread. I forgot I already left a previous comment but none the less my favorite banana bread. This is absolutely the best banana bread recipe I have ever used! Easy to make, moist and delicious! I have made this recipe five times and each time wonderful! I have added chopped pecans or chocolate chips and yum! 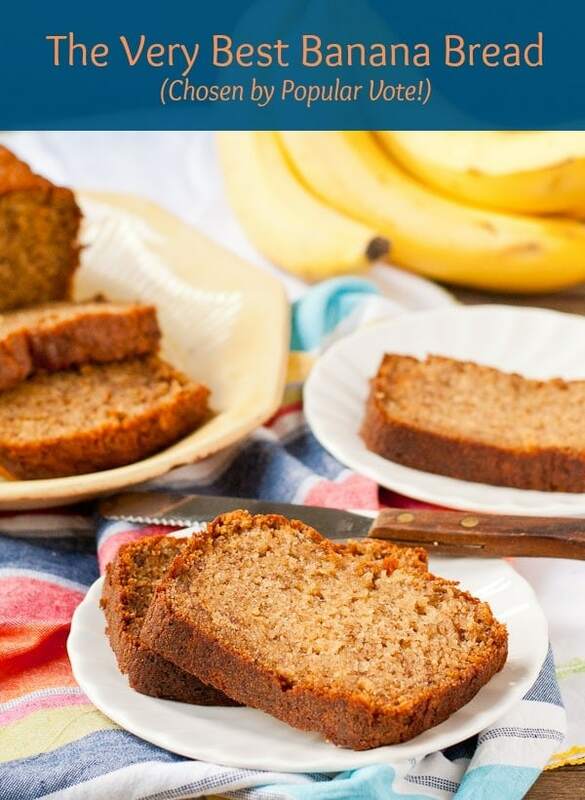 My weekly go to recipe for banana bread now!